Catholics and Protestants agree that the Scripture covers a lot of the really important, essential details of the Christian faith. They also have to admit that only the Scripture remains as our only uncontested source of Apostolic tradition. So, when the Bible says quite a few times that Jesus is unequivocally without sin (1 Peter 2:22, 2 Cor 5:21, Heb 4:15, 1 John 3:5), it seems like an awfully big omission to not include that detail about his mother if that were such an important statement of fact. Your objection is noted, but on both Scriptural and traditional grounds we are going to show there is significant reason to doubt the sinlessness of Mary. Indeed, there is not a righteous man on earth who continually does good and who never sins (Ecc 7:20). There is no one righteous, not one (Rom 3:10). Truly I say to you, among those born of women there has not arisen anyone greater than John the Baptist! Yet the one who is least in the kingdom of heaven is greater than he (Matt 11:11). This may be a legitimate point. This is because those born of the Spirit are indwelt by God Himself, and because of His righteousness exceed the righteousness of men that are not. So, John the Baptist in his own right would not be greater than anyone who has the Holy Spirit. When His own kinsmen heard of this, they went out to take custody of Him; for they were saying, “He has lost His senses…” Then His mother and His brothers arrived, and standing outside they sent word to Him and called Him. A crowd was sitting around Him, and they said to Him, “Behold, Your mother and Your brothers are outside looking for You.”Answering them, He *said, “Who are My mother and My brothers?” Looking about at those who were sitting around Him, He said, “Behold My mother and My brothers! For whoever does the will of God, he is My brother and sister and mother” (Mark 3:21, 31-35). The Biblical passage quoted here at the very least shows that Christ did not consider his mother (nor his brothers at the time) to be his disciples. Depending upon the rendering of the Greek translated as “kinsman” here, it is possible that Christ’s family publicly called Him a madman. It is worth noting, however, that the original Greek (“οἱ παρ’”) in the Septuagint’s rendering of Susanna 13:33 can mean something along the lines of “friends.” So, certain translations such as the NIV probably go to far in conflating the kinsmen in Mark 3:21 to Christ’s literal family. While Jesus was saying these things, one of the women in the crowd raised her voice and said to Him, “Blessed is the womb that bore You and the breasts at which You nursed.” But He said, “On the contrary, blessed are those who hear the word of God and observe it” (Luke 11:27-28). This verse is the most convincing and definitive in the Scripture. Many give St. Mary the title, “The Blessed Virgin Mary” which is strikingly at odds with how Jesus responded to the idea. This does not mean that Mary is not blessed, she is (Luke 1:45), but Christ viewed the blessedness of faithful obedience to be greater than the womb that bore Him and the breasts that nursed Him. 1. She is a chosen vessel of God to bear God Incarnate. 2. The fruit of her womb is blessed. 3. She believed what the Lord told her. None of these things speak specifically of her character or being in anyway. She is righteous by faith like the rest of us are according the the passage in Luke 1:42-45. Because of this understanding, Christ declined to call his own mother blessed and instead called all those who are faithful blessed–because no one is blessed because anything in themselves, but rather they are credited righteousness for their faith (Rom 1:17). He was justly indignant, that persons so very near to Him stood without, while strangers were within hanging on His words, especially as they wanted to call Him away from the solemn work He had in hand. He did not so much deny as disavow them. And therefore, when to the previous question, Who is my mother, and who are my brethren? He added the answer None but they who hear my words and do them, He transferred the names of blood-relationship to others, whom He judged to be more closely related to Him by reason of their faith (Tertullian, Against Marcion, Book 4, Ch. 19). For, doubtless, some such train of thought as this passed through her mind: ‘I conceived Him That is mocked upon the Cross. He said, indeed, that He was the true Son of Almighty God, but it may be that He was deceived; He may have erred when He said: I am the Life. How did His crucifixion come to pass? and how was He entangled in the snares of His murderers? How was it that He did not prevail over the conspiracy of His persecutors against Him? And why does He not come down from the Cross, though He bade Lazarus return to life, and struck all Judaea with amazement by His miracles?” The woman, as is likely, not exactly understanding the mystery, wandered astray into some such train of thought (Cyril of Alexandria, Commentary on John, Book 12). And therefore He answered thus in this place, and again elsewhere, Who is My mother, and who are My brethren? Matthew 12:48, because they did not yet think rightly of Him; and she, because she had borne Him, claimed, according to the custom of other mothers, to direct Him in all things, when she ought to have reverenced and worshiped Him…And so this was a reason why He rebuked her on that occasion, saying, Woman, what have I to do with you? instructing her for the future not to do the like; because, though He was careful to honor His mother, yet He cared much more for the salvation of her soul, and for the doing good to the many, for which He took upon Him the flesh (John Chrysostom, Homilies on the Gospel of John, Homily 21). They have no wine. For she desired both to do them a favor, and through her Son to render herself more conspicuous; perhaps too she had some human feelings, like His brethren, when they said, Show yourself to the world John 17:4, desiring to gain credit from His miracles. Therefore He answered somewhat vehemently” (John Chrysostom, Homilies on the Gospel of John, Homily 21). …St Hilary in his Annotations on the 20th verse of the cxixth [119th] Psalm, “My soul breaketh for the longing that it hath unto thy judgments,” applies it unto the future judgment and among other observations has this passage, “Seeing we must render an account for every idle word do we desire the day of judgment in which that unwearied fire is to be passed through in which those grievous punishments are to be undergone for the expiating of a soul from sin [1 Cor 3:12], a sword shall pass through the soul of the blessed Virgin Mary that the thoughts of many hearts may be revealed [Luke 2:35]. If that Virgin who bore God is to come into the severity of the judgment will any one dare desire to be judged by God?”(Excerpt of Hilary of Poitiers Homily on Psalm 119). Although they [Christ’s family] had like the rest power to come in, yet they abstain from all approach to Him, “for he came unto his own, and his own received him not” (Hilary of Poitiers commenting of Matt 12:50). 1. 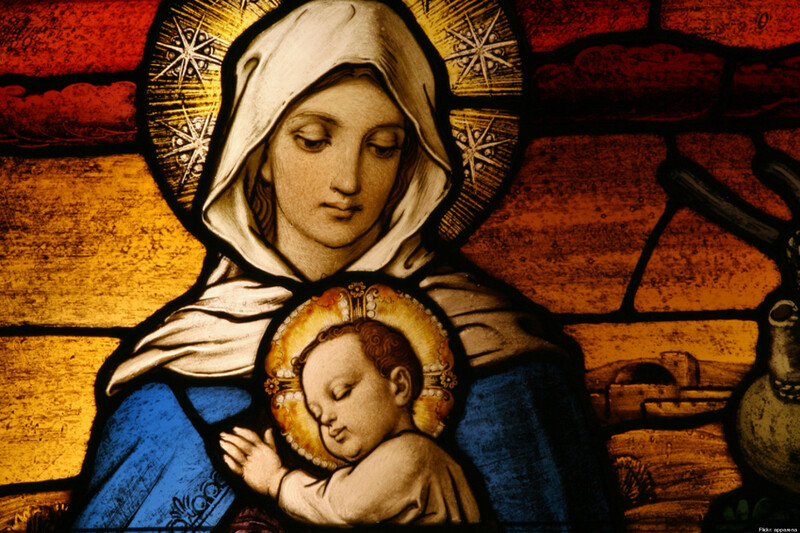 The Scripture does not explicitly call Mary sinless, and though the Scriptural evidence is suggestive that she is not an exception to Rom 3:10 it is not logically impossible that Mary would be exempt. 2. It was not considered heretical in the ancient church, at least for a time, to speculate that Mary was at times lacking in faith and committed wrongdoing. For what it is worth, the Eastern Orthodox Church in the modern day does not take a definitive stand on the issue. The most we can say based upon the evidence is that it is suggestive that Mary sinned, but we cannot definitively prove it. However, the issue is not important. Mary’s sinlessness saves nobody, because she did not satisfy the wrath of God against sinners like us. Christ’s sinlessness does. In Genesis 3:15 Scripture says that there will be enmity between the serpent (aka devil) with the woman between devil seed and the woman seed. If you agree that this verse is the first good news in the Bible then the woman refers to Mary and her seed refers to Christ. Suppose Mary sinned (as you wish she did), then she cannot fulfill this prophecy because Scripture says he who sins belong to the devil (1 John 3:8). Contrary to what you wrote Catholics do not need sacred Tradition to proof her sinlessness! The difference between her sinlessness and that of Christ is obvious. Christ is sinless by His own power as the second Person of the Holy Trinity. Mary, on the other hand, was sinless not by her power but by grace of God. When the angle greeted her, the Greek word is “kecharitomene”, mostly translated as “full of grace” in English, though some faulty translations use “highly favored”. The word itself is a verb – the passive perfect tense of the Greek verb “charitoo”, meaning to give grace. The use of perfect tense in Greek, unlike in English, indicates that she was always in grace. In Greek perfect tense refers to completed action with continuing results to the present. She is the only person in Scripture who received the honor! Ecc 7:20 and Rom 3:10 say that no one is righteous but you overlook many verses saying there were (and are) righteous persons. Examples are Noah (Genesis 6:9, Ezekiel 14:14), Daniel and Job (Ezekiel 14:14), Joseph (Matthew 1:19), Zechariah and Elizabeth (Luke 1:6) and without naming them (Psalms 1:6, 5:12, 34:15, Matthew 5:45, 13:17, 10:41, 23:29, 1 Peter 3:12 etc.) Keep in mind that being righteous is NOT being sinless – do not confuse these two. Scriptural definition of being righteous is given in 1 John 3:7. Mark 3:21, 31-35 and Luke 11:27-28 are favorite verses to downgrade her, like you did. Just imagine your own mother came to see you and waited outside your house. Upon knowing her arrival, instead of opening the door and welcoming her, you said the same words “For whoever does the will of God, he is My brother and sister and mother” and refused to see her. Ask yourself, does it sound an appropriate attitude to the woman who bore you in her womb and raised you up? Certainly Christ, being sinless, cannot be guilty of dishonoring His own mother, one of the Ten Commandments. Christ’ statement can be explained scripturally. When the angel told Mary that she will conceive Christ, her response was “Behold I am the handmaid of the Lord, let it be to me according to your word”. Remember in those days any woman who became pregnant outside marriage would be stoned to death. Yet she fully and unconditionally trusted the words she just heard from the angel – though she might not fully understand them. How could she become pregnant without having sexual relation with man? Christ’ statement in Mark 3:21, 31-35 and Luke 11:27-28 indeed praised her unconditional obedience and submission to the will of God! It seems you have problem with Mary being blessed among women, which Scripture does say (Luke 1:42). There are two women in Scripture referred as “blessed among women”, Mary and Jael (Judges 5:24). The difference is the phrase “ALL generations will call her blessed” (Luke 1:48) is applied to Mary. Catholics fulfill this verse whenever they recite Hail Mary while hardly any Christian remembers who Jael was. 1. I do not wish that Mary had sinned, though I would say a more unequivocal statement one way or the other in Scripture would be nice. 2. Which sacred tradition? The Church Fathers you ignore because it does not fit the later Catholic understanding, or the Church Fathers you agree with because it does fit that understanding? 3. Your exegesis here does not allow for the interpretation you give. Everyone sins and belongs to the devil, but in Christ this is undone. Whether this be true of Mary, or not, is irrelevant to Christ, because he is not literally from the seed of Adam because he was conceived by the Holy Spirit. Therefore, He does not have original sin. Whether or not Mary sins is irrelevant to whether Christ would have original sin, because the Scripture says that “The soul that sins shall die” (Ezek 18:20). Christ did not sin, nor was he in Adam’s loins when he sinned, so Christ cannot and did not die for Adam’s sin and in His human nature never sinned, so Christ never sinned in any way. She is also the only person that ever gave birth to God Himself incarnate, so it is definitely a gift of grace in accordance with God’s forknowledge of all events (which is why she was always seen as full of grace.) What the Scripture does not say here is that full of grace means sinlessness or the ability to dispense grace to third parties. That is stuff you might want to pretend that it means, but in the context of the actual discussion, no comment is made about Mary’s innate goodness, but rather the discussion is about Jesus Christ. hence, my interpretation contextually makes a lot more sense and does not rely upon presuppositions such as yours. Actually, being righteous IS being sinless. Ecc 7:20 explicitly says “there is not a righteous man on earth who continually does good and who never sins.” Hence, righteousness is continually doing good and never sinning. That seems to be a workable definition that is pretty explicit. So, at the very least, Ecc 7:20 and 3:10 are blanket condemnations which serve to prove “that both Jews and Greeks are all under sin” (Rom 3:9) and “God has shut up all in disobedience so that He may show mercy to all” (Rom 11:32). Now, there is at least one clear exception to this rule: Christ is a righteous Man, who was on Earth, that always did good and never sinned. The question then is if there is a SECOND exception for Mary. I just do not see the Scriptural merit for this idea and it appears that you misunderstand both original sin as I already covered and the depravity of man. That verse is not a definition, while Ecc 7:20 is, though I happily affirm both. It says nothing of the sort and anyone who actually reads those verses can clearly see for themselves that your interpretation is plainly wrong. No, if you even care to notice, I am not necessarily arguing against that Mary wasn’t a perpetual virgin. I am merely showing that it is not heterodox to believe that Mary would be included on Rom 11:32, Rom 3:9-10, Ecc 7:20, and etcetera, as it appears there were church fathers that shared this understanding. The blessedness of Mary is that she was the Theotokos, not that she necessarily was given a miraculously sinless nature which the Scripture appears to mitigate against. You wrote “I do not wish that Mary had sinned, though I would say a more unequivocal statement one way or the other in Scripture would be nice.” Then why did you try so hard to proof she was not sinless? You wrote “Which sacred tradition? The Church Fathers you ignore because it does not fit the later Catholic understanding, or the Church Fathers you agree with because it does fit that understanding?” I did not quote from any Tradition to proof her sinlessness. You don’t accept it for simple and classic reason: you already predefined your belief before you open the Bible, i.e. that she was not sinless. You wrote “Your [my] exegesis here does not allow for the interpretation you give. Everyone sins and belongs to the devil, but in Christ this is undone. Whether this be true of Mary, or not, is irrelevant to Christ, because he is not literally from the seed of Adam because he was conceived by the Holy Spirit. “ We are talking about Mary sinlessness, not about Christ’. You wrote “She is also the only person that ever gave birth to God Himself incarnate, so it is definitely a gift of grace in accordance with God’s forknowledge of all events (which is why she was always seen as full of grace. )” You confuse between God Election (of her to become Theotokos) with Grace. You wrote “Actually, being righteous IS being sinless. Ecc 7:20 explicitly says “there is not a righteous man on earth who continually does good and who never sins.” Pay attention on the word “continually”. If your interpretation is correct then this verse contradicts 1 John 3:7 and other verses that explicitly name or mention righteous persons. You wrote “The question then is if there is a SECOND exception for Mary” Scripture nowhere says that! You wrote “He did not say anything disrespectful about His family, and it is not disrespectful to say, “My mother is not a believer.” Did Christ say His mother was NOT a believer? You simply put your word in His mouth! You wrote “The blessedness of Mary is that she was the Theotokos, not that she necessarily was given a miraculously sinless nature which the Scripture appears to mitigate against.” You interpret Scripture to follow your predefined belief! Going back to Gen 3:15 the verse says both the woman and her seed are in enmity with the devil. Because I am interested in the truth that the Scripture teaches. Mary’s sinlessness (or sinfulness) is not a matter of salvation for the Protestant, as we believe we are saved by Christ alone as the Church has always taught. Hence, I can like Chrysostom speculate that Mary has done things worthy of rebuke without meaning any disrespect towards her. But you cited that you had tradition. I know that it is there, I am just showing that tradition also may go the other way as well. That’s totally untrue. I was schooled on the Bible by a Catholic and read all Catholic writers years before reading a single Protestant. THat’s the truth. I read the Bible for my own and was surprised to find out that Mary did not play some huge role. You brought up that if Mary was not sinless, that Christ would have original sin. My point is that original sin is 1. contracted from the seed of the father which is why it is through Adam, and not Eve, we all die; and 2. We do not know Jesus’ DNA. Mary might have bore Jesus but He was conceived by the Holy Spirit…being that there was not a sperm, there might not have been an egg either, so your whole point of Mary being sinless to prevent original sin has no biblical merit and is highly speculative. It shows a misunderstanding of how any of us have original sin to begin with. We were in Adam’s loins when he sinned and thus partook in the sin. Christ, not having descended from Adam’s seed, was not a partaker in the sin. This is indeed possible if your presupposition of Mary’s sinlessness is true. However, being graced with the honor of bearing God is still gracious, and hence she can be full of grace without any inference of being sinless. Well, that’s the Biblical definition as found in Ecc 7:20. The Bible also teaches that the righteous shall live by faith (Rom 1:17). Hence, the righteous are not righteous because what they do, because they cannot meet the requirements as found in Ecc 7:20. So, the ones you read about such as Job and Noah are righteous because of their faith, not because of their works. Both Noah and Job sinned, which is proof that their faith saved them and not their perfect track record. As for 1 John 3:17, as I said, is not a definition of righteousness. It makes the observation that righteous men act righteously. THis, of course, is common sense. Faith does not exist in a vacuum where it does not produce good works. Exactly, which is why the simpler explanation is that Mary would be included under Rom 3:10. The same words that Chrysostom is. Jesus said those who believe in Him are His family. He said this at a time when by saying so and not seeing his family, he in effect denied them in favor of His disciples. From this we INFER she was not a believer at the time. Because this is an inference, I cannot be certain that this means Mary at the time was lacking in faith. However, it is obvious that it is the more obvious and likely inference. Ironic you say that and then approach Gen 3:15 by a predefined belief. Mary being the second Eve is not in the Bible. It is from Irenaeus. So, you need to be honest with where you derive your ideas from. It’s not from the Scripture. Her sinlessness is not a matter of salvation for Catholics either and we do not believe she is savior. Catholics do have Tradition as testified in Scripture (2 Thes 2:15) – the point is I do not need Tradition to prove her sinlessness – in fact it is not based on Tradition. Like Trinity and Original Sin, her Immaculate conception and her sinlessness belong to development of doctrine. You wrote that she did not play huge role – you forgot that Christ got her flesh through her as He spent nine months in her womb. Christ could come down as fully grown man – it saved time – yet God freely chose Mary to be His Bearer with her free consent (Luke 1:38). You wrote “You [I] brought up that if Mary was not sinless, that Christ would have original sin”. Where and when did I make that statement? As simple analogy, you would not place your baby in dirty crib, wouldn’t you? You clean it to make it ready for your baby, not to make your baby become clean though staying in pre-cleaned crib. Thus Mary was prevented by God (her Saviour, Luke 1:47) from Original Sin because she was the Bearer of Christ. You wrote “Job and Noah are righteous because of their faith, not because of their works”. There is righteousness that comes through faith – no problem with that. But faith is NOT the only right thing that makes one righteous as 1 John 3:7 says He who does what is right is righteous – it does NOT say he who has faith is righteous. When Christ said that the righteous shall enter the eternal life (Matthew 25:46), it is NOT based on righteousness that comes from faith alone as taught by the Reformers. 1 John 3:7 does not contradict Ecc 7:20 – in order to avoid this contradiction you deny the former as definition simply because it does not fit you. If you read Ezek 18:21-28, you will note that a wicked (sinner) man can become righteous if he turns away from his iniquities. If being righteous is a state being continuously sinless, then a wicked man can never become righteous – yet Ezek 18:22 says he shall live for his righteousness and all his past sins/transgression will be forgotten. You put John Chrysostomos word in Christ lips because it fits you. The interpretation of Gen 3:15 is not based on what Irenaeus wrote – I did not even mention him and neither did I mention Mary as second Eve in the same way you borrowed Chrysostomos statement! Gen 3:15, NOT Irenaeus, clearly says the woman and her seed are in enmity with the devil. Isn’t that clear enough? The problem is that it isn’t in the Scripture so ultimately you are using tradition, which is why the verses you use actually don’t say what your presuppositions tell you. I will show you in my treatment of your exegesis of Gen 3:15. The manger did not play a huge role,even though Christ was born there. God could have easily chosen another woman,b ut He was gracious in choosing Mary. Me: “You [I] brought up that if Mary was not sinless, that Christ would have original sin”. This is a little frustrating, because I point out the obvious that you are saying Mary could not have original sin as it would affect Christ, and you reply to say that you never said that and in the very next sentences contradict yourself and literally say what I said what you were saying. Well, what you are saying is still wrong. Christ was born in a manger, there was not some sort of necessity that Christ be born somewhere clean, physically or morally. This is something you just made up out thin air. Where does the Bible say that Christ would be contaminated with uncleanliness or original sin or anything else if the Theotokos had committed sin? Viva, simply you are wrong and you do not understand the Scripture. God’s bar for righteousness is two things: perfect living (“You must be blameless before the Lord your God,” Deut 18:13) OR faith (“to the one who does not work, but believes in Him who justifies the ungodly, his faith is credited as righteousness,” Rom 4:5). There is no other way. Complete blamelessness in word and deed (which neither Noah nor Job were) or blameless by virtue of Christ paying the penalty for all your sins. There is no middle road where it is part Christ paying the penalty and part righteous living. The fact you quote 1 John 3:7, which does not say what you claim, shows how radically you misunderstand the Christian religion. 1 John 3:7 is an admonishment towards righteous living, not a soteriological passage that tells us HOW we are right before God. For example, the previous sentence reads “no one who abides in Him sins.” Yet, the first chapter of the book states, “Those who say they are without sin are liars.” (If Mary said that, would she be a liar?) So, 1 John 3:7 cannot be making a total and complete observation of how we are made righteous or it contextually contradicts the idea that men must never sin, something that John himself contradicts earlier in the book. Obviously, his point is that those who abide in Christ live righteously and not like devils. It is a general observation and admonishment, not a soteriological statement. And if you go on believing this you will die in your sins, which I don’t want to happen to you. Matt 25:46 says the righteous inherit eternal life. They sure do. Abraham was righteous by faith (Rom 4:2-5), we are saved grace through faith, not works (Eph 2:8). If you think that the righteous are righteous by virtue of what they have done, and not what Christ has done, then you are like the goats who boasted of their works during the judgment and were cast into outer darkness. You will find that your view of how you are right before God is not the ancient view, and I caution you away from leaving the view of the early Church. I deny it because it is 1. not offered as a definition unlike Ecc 7:20, 2. Does not make sense contextually, 3. such an interpretation contradicts the rest of Scripture and requires incredible misreading. Yes, no one here is saying that the faithful do not also have to repent. The thief on the cross did nothing other than repent and place his faith in Christ. David did not but repent and place his faith in Jehovah. If you want to say that “repentance+faith” is needed for salvation, sure I won’t deny that. Do you wonder how this works? When the ungodly man like YOU and ME repents and places his faith in Christ, then God justifies the ungodly man. Hence, there are two ways to heaven: perfect righteousness or repentance and faith. One gets you in because you never committed sin, the other gets you in because you are accounted as sinless by God’s grace. No one gets in the former way. Yes, and they make sense with what is actually written in the Bible. Who’s the woman? You say Mary. Yet, it does not say that. Is it Eve? Is it Israel personified? Is Christ the seed of Eve or even Mary? Do women have what the ancients consider a “seed?” Without invoking the interpretations of men like Irenaeus (which are not necessarily wrong, I am just pointing out where you would have to derive the idea), you cannot definitively state that the woman is Mary. You wrote “ultimately you [I] are using tradition”. Can you point out where did I cite from Tradition? I quoted from Scripture – you don’t accept it is because you already pre-decided not to believe in it. You wrote “The manger did not play a huge role, even though Christ was born there” The manger was just dead object . You wrote “God could have easily chosen another woman,b ut He was gracious in choosing Mary.” God has a divine plan for each one of us. He chose Mary, not other woman. You wrote “This is a little frustrating, because I point out the obvious that you are saying Mary could not have original sin as it would affect Christ, and you reply to say that you never said that and in the very next sentences contradict yourself and literally say what I said what you were saying.” Just browse my earlier response and quote my statement that says “Mary could not have original sin as it would affect Christ”, which you clamed I did. If Catholics believe in such thing the logically Mary’s mother must also be immaculately conceived in order to make Mary not having original sin and it goes on and on. You wrote “Where does the Bible say that Christ would be contaminated with uncleanliness or original sin or anything else if the Theotokos had committed sin?” You try to turn the table – I never wrote that Christ would be contaminated with Original Sin unless Mary was born Immaculate. That false thinking is in fact yours but you try hard, but fail, to turn it into mine. I believe you are the one who is wrong in understanding scriptural righteousness. If you read Deut 18:9-14 you will see the context of Deut 18:13. I have no problem with Rom 4:5 – the verse does NOT say ONLY faith is credited as righteousness. Based on your interpretation of Ecc 7:20 a righteous person must be sinless. Yet Scripture plainly and explicitly says that Noah, Job and Daniel were righteous, though they were sinners. Either Scripture contradicts itself or your understanding of Ecc 7:20 is wrong. You keep on denying 1 John 3:7 as definition of being righteousness because it does not fit your belief while Ecc 7:20 does. I suggest you to read Matthew 25:31-46 thoroughly and see what Christ meant by being righteous. For sure it contradicts what you have been taught but that’s what the Bible says. Christ did not teach salvation by works, even partially and neither does the Catholic Church. We believe in salvation by grace because unless we are moved by Grace given through Christ we are unable to do what is right (John 15:5). Our righteousness does come from God – you would agree with that. The difference between Catholicism and Reformers is the latter taught that righteousness comes only through faith and it is imputed on us, which is found nowhere in Scripture. Catholics, on the other hand, believe that God’s righteousness is infused in us through faith and sanctification. Indeed Scripture says we are saved through faith (Eph 2:8, one of the most cited verse) and sanctification (2 Thes 2:13) – both are works of God. Synergism does not teach that we contribute in our salvation – that’s what most monergists caricature it. We neither boast our good works nor contribute in our salvation by doing them – it is God who works in us to do them (Phil 2:12-13). The goats in Matthew 25 did not boast their works because they didn’t do them. Ironically you claim they did when you wrote “then you [I] are like the goats who boasted of their works during the judgment and were cast into outer darkness”. Where you got the idea that the goats boasted their good works? The thief on the cross died shortly after repenting and put his faith in Christ – he did not need to undergo sanctification. You wrote “And if you [I} go on believing this you will die in your sins” Contrary to what you wrote, Catholics considers sinning is something serious. That’s why Christ gave the authority to forgive sin to the Church (John 20:23) and that’s why some of us have to be cleansed in purgatory before entering heaven. Let me ask you this simple and easy question and pls answer it. Suppose a member of your church whom you know to be born again Christian, committed adultery. He died before he has a chance to ask forgiveness from God for his sin (for sure He will forgive). My question for you is did he end up in heaven or in hell and why? Pls. quote Scripture to support your answer. As I already expected you deny Gen 3:15 to refer to Mary and Christ – the only way of escape and you are not the first one who took this route. The verse does not name the woman but neither any messianic prophecy in Old Testament explicitly names Jesus. We do not Irenaeus or any Church Father to apply that verse to Mary and Christ. Seed of woman, translated as descendant in most Bible, is also applied to Hagar (Gen 16:10) and to Rebecca (Gen 24:60). You are fully entitled not to believe the woman refers to Mary. My question for you is (1) who is her seed, the one that bruise/crush serpent head and (2) who the woman refers to? Your interpretation of Gen 3:15 isn’t plainly what Gen 3:15 says, so you reading into Gen 3:15 a tradition. I already stated this, but for your benefit, I restate it. I quoted from Scripture and tradition — you don’t accept it because you already pre-decided not to believe it. The ironic part is that, as I already told you but I will restate it for your benefit, is that I read the Bible initially presuming the stuff about Mary was true…until I found out it was not in the Bible nor most of the church fathers, which made me come very strongly against modern Catholicism. And Mary is a human being, whose sin or sinlessness has no effect on Christ, what’s your point? Exactly, which is why she is full of God’s grace, no one has been bestowed more grace than her. You just made the argument that “Mary was prevented by God (her Saviour, Luke 1:47) from Original Sin because she was the Bearer of Christ.” Clearly, the inference in this is that if Mary had original sin, this would compromise her ability to bear Christ (not physically, but spiritually). So you are speaking two sides out of your mouth, mean what you say and say what you mean. I never claimed that Catholic doctrine made sense or is internally consistent. I doubt it, Aquinas and Chrysostom would squarely agree with me http://christianreformedtheology.com/2015/04/19/faith-alone-before-luther/). Yes, the context is that God expects total obedience, which is how I (and Augustine in On Man’s Perfection in Righteousness, Chapter 9) convey the meaning of the text. Simply saying “context” is not an argument. You have to show how it is out of context, which you cannot, because it isn’t. Thomas Aquinas understood the verse to mean that, as do I, as does that it excludes works and thereby does not leave any other options. To quote Aquinas: “They said that he who kept not the Law was cursed, but he proves that he who kept it was cursed, and he who kept it not, blessed. Again, they said that he who adhered to Faith alone was cursed, but he shows that he who adhered to Faith alone, is blessed.” So, you may disagree with me (on what grounds I do not know, the grammar does not allow for anything other than faith to save), but don’t go about pretending that justification by faith alone has no theological or grammatical merit, whatsoever, as I can find “faith alone” in many texts far before the Reformation. All those men were indeed unrighteous by their works in of themselves, but were accounted righteous due to their faith. THere is absolutely no contradiction. In fact, Ecc 7:20 is so unequivocal and clear, it is striking that you cannot even exegete the passage from your perspective and have it make sense. Let me issue you a polite warning, I mean this in kindness. It is fine to debate and bring up valid points, but I in detail exegeted 1 John 3:7, with its context. If you disagree with the exegesis, you need to actually show me why. Simply issuing an ad hominem that I “keep on denying” because “it does not fit your belief” when I carefully and intelligently responded to your point makes you look very ignorant, and it is disrespectful to me. Take care in your response, because if you do not intelligently address my points, next time I will delete our response so that readers here will not falsely assume that I have conceded a point you you which I have not conceded. You are not on a Catholic website here, so please refrain from ad hominems. Thanks. Actually, it doesn’t please read the link I have already responded to such an idea in detail. We all agree, let’s continue. Hey, I agree too! It’s not explicitly in the Scripture, it is my contention that it is the only valid inference we can draw from the Scripture, let’s continue. Hey, I disagree! What you just wrote is also not in Scripture and it is my contention that you are drawing an invalid inference from the Scripture in saying this! It should also concern you that this “grace infusion” was taught by nobody in the ancient church (no one, zilch, nada) while forensic justification is actually theorized by the early church (http://christianreformedtheology.com/2015/06/01/the-great-exchange-and-forensic-jusification-in-the-early-church-fathers/). So, I would argue my Biblical inference is the time honored tradition of the church while yours is a baseless, logically inconsistent, later innovation. We are save by grace which is identical to sanctification (reread 2 Thes 2:13, it says “sanctification by the Spirit”). We are saved THROUGH faith. So, grace/sanctification is the basis and faith is the means. No one can confess Christ is Lord except by the Holy Spirit (1 Cor 12:3), so faith is a spiritual gift of God. So, there is no faith without grace and no saving grace without subsequent faith. They are not two diametrically opposed, different avenues in which the Christian can be saved. You are obviously confusing the sheep with the goats…reread Matt 25. So do I, which is why the Catholic teaching that I need constant infusions of grace to escape the consequences of sin is to me wholly inadequate, because the moment any one of us walks out of the confessional we have coveted, lusted, committed idolatry, disrespected a parent, or committed some other gross sin in our minds. If we are not forgiven once and for all through faith, the alternative is hoping to die a second after confession and partaking in the Eucharist. Because sin happens right away and often, and the consequences of sin are death. If you appreciated this fact more, you might actually become afraid that you are not right with God and need to trust Him alone, and not anything you can do, for your salvation. 1. Only God knows who is committed. 2. THose GOd knows, like David, can commit adultery and be saved. 3. Normatively those who commit adultery are not saved, nor are liars, sodomites, swindlers, and others (1 Cor 6:11). It may very well apply to Mary, I don’t deny it. In fact, I will go as far as to say it is the simplest explanation. My point is, from the Scripture alone, you cannot prove the conclusions you wish to draw from that passage without bringing is extra-biblical presuppositons. THis is more an intellectual question, so I will give you my interpretation. First and foremost, I DO NOT believe original sin is transferred via women. It is transferred via fathers. Because Christ did not have an earthly father, this exempts him from original sin. Second, “seed” in Hebrew often times means “descendant” (http://biblehub.com/hebrew/zaracha_2233.htm). So, the seed is Christ, but I do not believe the hebrew in Gen 3:15 is meant to take on a biological connotation such as that in Lev 15:17 (http://biblehub.com/hebrew/zara_2233.htm). Hence, the woman can be either Eve or Mary, because both are the mother of the descendant who by virtue of giving birth to Him, crush Satan. I do not believe my interpretation is radically different than yours, I just do not draw the inferences from it that you do because in reality, you are trying to justify an extra-biblical belief about Mary. What does Gen 3:15 have to do about Mary’s sinlessness. Absolutely nothing. Yet, you bring it up. Is this still your position on the sinlessness of the Theotokos?